Baby theatre can be all about tricks. Changes of light, particular patterns and colour combinations, spectacles and facial hair, can all produce effects. Some theatre for babies can be entirely made up from these tried and tested triggers. Not so Neverland. It’s not that Tom Penn’s show completely ignores these things, but it appropriately prioritises other aspects of the theatre experience. 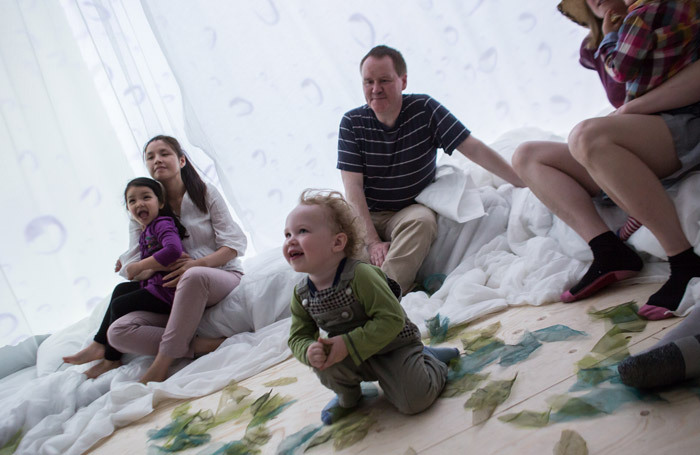 Firstly, it creates a comfortable, inviting, baby-friendly (and adult-friendly) environment: a cross between a carpeted bedroom and a cosy tent, all in white which is handy for creating subtly brilliant visual effects. Secondly, the show is made up of a series of imaginative interactive games, building on and flowing into each other. Under three-year-olds really don’t need a story to follow. Nor is language crucial, as this show performed in English, French and Japanese demonstrates. The performers’ own warm, sincere and playful demeanour effectively engages the audience – that and a quirky use of socks. Within a professional context, it is heartening to see baby theatre created with such care, forethought and rigour. A show like this one, at Battersea Arts Centre, implies genuine respect for the youngest audience. From the audience perspective, it is delightful for parents to witness theatre that awakes joy and wonder in their child, maybe even for the first time.